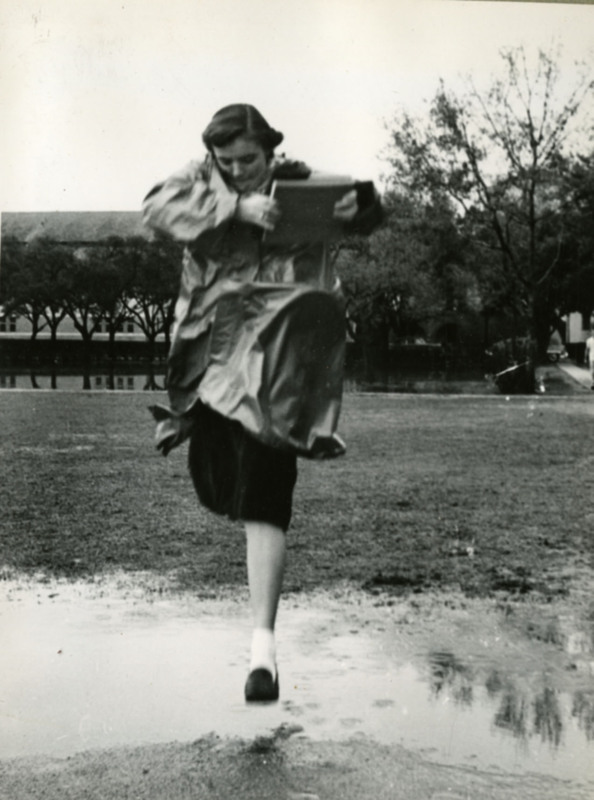 I got soaked today on my way home from lunch, unlike this clever lass who managed to dodge the water in 1952. But where is she? The photo was with a bunch of others all clearly taken on campus, but I can’t quite see this. Bonus: Another video! This is one of my favorites so far, as Brandon has kept some of my “humor” in there. Don’t worry if you miss it–I was holding back. The video is great. Does anyone know the history of the Gothic R as Rice’s athletic logo? I’m sure it came from the baseball program, but who proposed it? (One source says it was worn by the 2003 NCAA championship team.) TIA to anyone who can give an answer. Melissa, I think you are looking at Baker College from a point near the present location of the Pavilion. When I got to Rice in 1959 there was a ditch that would fill with water about the point where you see the puddle of water in the picture. Thanks, Bob. Looking at it again, I think you’re right. Melissa no doubt knows more on this subject. I note that Coach Graham came to Rice in 1992. Coincidence? Am I crazy? I thought the Olde English R had always been around, at least in modern times. I’m almost 100% sure that it was occasionally seen if not commonplace when I got here in 1980. I know Rice registered a bunch of trademarks, especially athletic logos, much later. I find the little “TM” on Rice gear to be sort of overly precious, actually. Grungy, do you have any insight on the Olde English R? I actually don’t now anything about this at all. I’m out of town right now so I can’t go looking for it but I will when I get back next week. Yeah, I think it’s looking back toward Baker from over near the library. Those groups of four little windows look like Baker.